This is a milk plastic bottle. It’s made out of transparent plastic. You can go ahead and decoupage right on it. But in my experience transparent, green or brown plastic bottles do not turn out well that way. So, first you have to paint the part of the bottle or the entire plastic bottle you wish to decoupage. I used white paint for this decoupage idea and painted only a middle part of the plastic bottle. Then when the paint has dried up I decoupaged it over with spring flower napkin. I used glue for this project. Sometimes I use transparent furniture polish. I pricked holes on the top part of the plastic bottle vase. 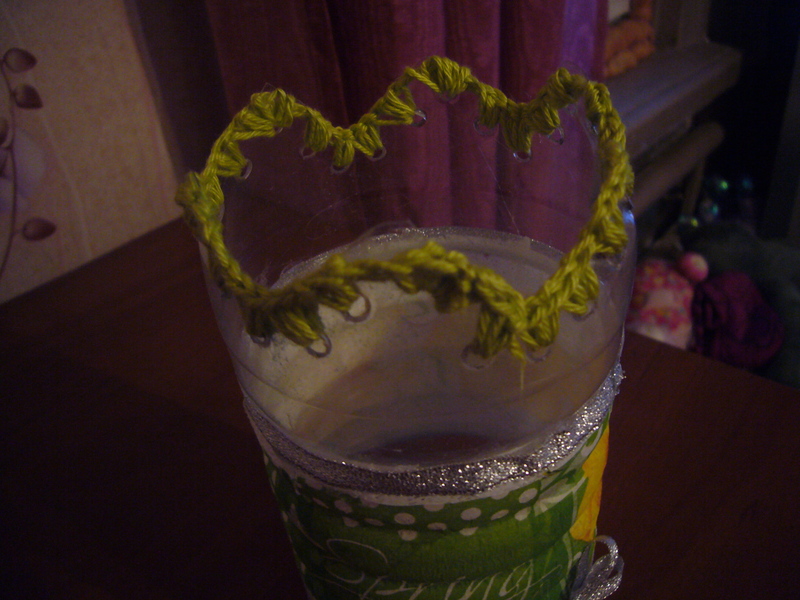 Then I crochet it over with green yarn. Then I glued the silver ribbon using thermal glue. 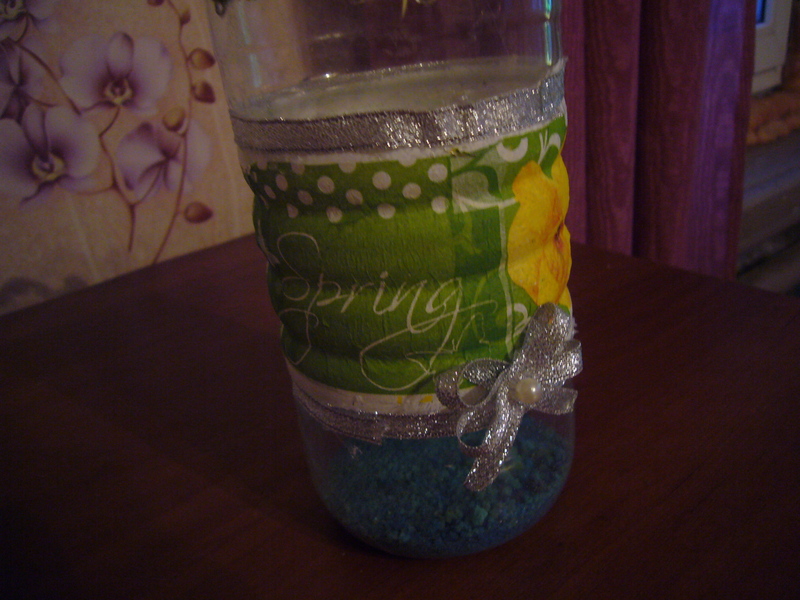 I have put some of the colored salt inside the vase, as I am planning to use it in my bathroom to store brushes in. 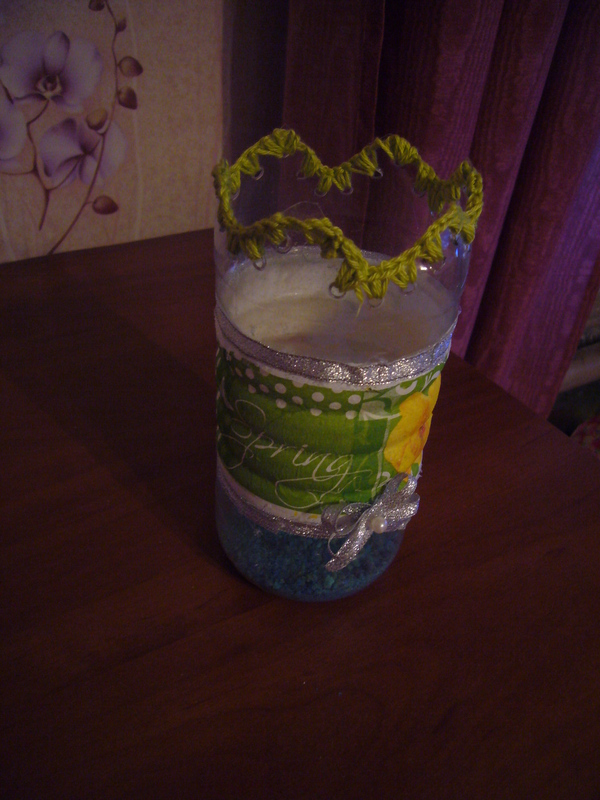 As the plastic bottle vase is very light, it easily turn over. The salt makes it look even nicer and makes it stand firm. That’s an easy to do DIY decoupage idea and a good idea for recycling crafting. 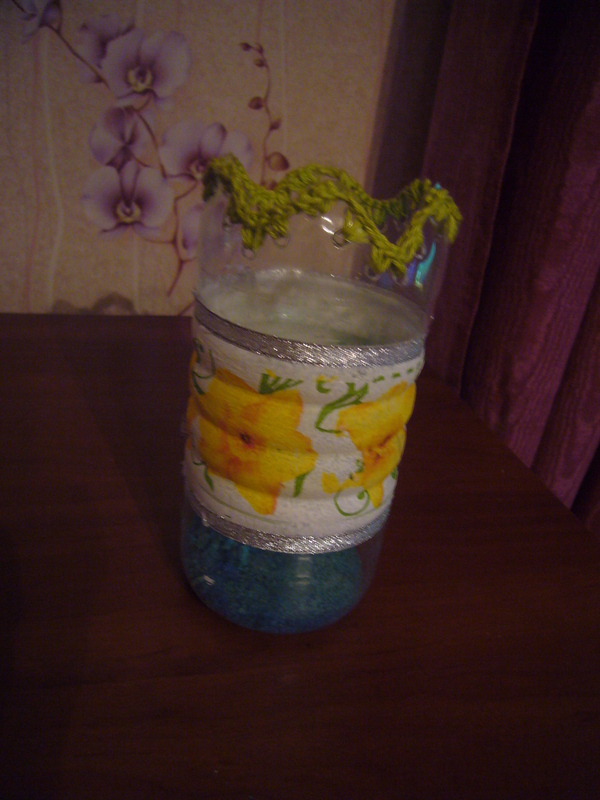 This entry was posted in Crafting Tutorials, Crocheting, Decoupage ideas and tagged busy moms, crafts, creative tips, creativity, crochet, crocheting, decoupage, decoupage how to, decoupage ideas, decoupage ideas: plastic bottle decoupage, decoupage on plastic, decoupage step by step, decoupage tips, DIY, green living, plastic bottle upcycling, platic bottle crafts, recycled crafts, recycling, upcycling. Bookmark the permalink. i host it on free wordpress.